Well, we really like the 2010 Chevy Camaro in black. Seriously — a lot. But in white? Not so much. Never matter, we're always happy to see new details on the new muscle car from the General's budget bargain basement brand. So what's the new detail we found — other than we really don't like the new mullet-mobile in white? Well, the engineering team is in Florida along I-75 with at least one white and one black Camaro and they're doing testing of the engine to see how it performs in high humidity. Well, guess they didn't want to wait for the summer in Detroit, eh? 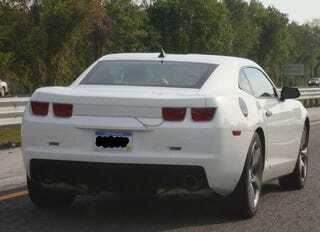 We've included two more shots below, as well as the rest of our spy photos of the new 2010 Chevy Camaro.